This week I was given a code for a new app in the Dr Seuss series for iOS, Dr. Seuss Band. My daughter has The Cat in the Hat as her favourite film right now. She will watch it a couple of times in a row and laugh often. 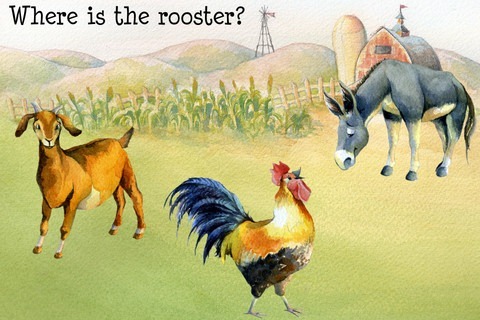 This means that when I get the opportunity to review the Dr Seuss apps these days I jump at it. Most of them are book based apps which are ok but of limited interest to the little one. But this week I got a new type of app that is a musical app. It works a bit like Guitar Hero, where you press buttons in time to coloured bars moving down the screen. • 2 Ways to Play – Go for high scores in the Music Game or use Free Play to compose your own tunes. • 10 Original Songs – Play along with the soundtrack from The Cat in the Hat, Green Eggs and Ham, Dr. Seuss’s ABCs, Hop on Pop and more! 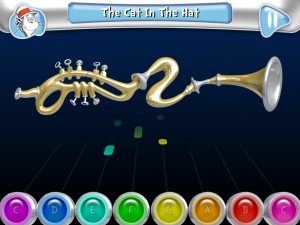 • 5 Unique Horn Instruments – Play Seussian versions of the Trumpet, French Horn, Clarinet, Trombone and Flute. • 10 Crazy Horn Effects – Customize the sound of your horn by adding fun effects like a Fish Bowl, Train Whistle, Reverb and more! 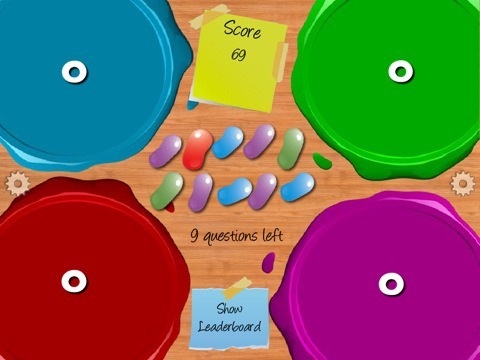 A friend told me about this app that she had used with her 4 year old called Jelly Bean Count. She couldn’t fault it so I thought we must give it a go. The idea is that you count the jelly beans of each colour, then using your fingers tap on the matching coloured circle. I have been chatting to @punflaykids on Twitter for a while now. We often say good morning to each other (despite being in different parts of the world) and have a little chat. “Sure” I answered and headed off to their website to check out what they had. Wow. These guys really have a lot of very interesting looking apps. I immediately went back with a shopping list of apps for the little one and they sent me a few codes. Let me just start by saying that these apps are brilliant. They are very close to Duck Duck Moose in being the best apps I have seen for my daughter. She has not stopped playing them since I downloaded them. The thing I love is that, as well as being fun, they are very educational, covering spelling, numbers, shapes, rhyming and spacial concepts like up and down. 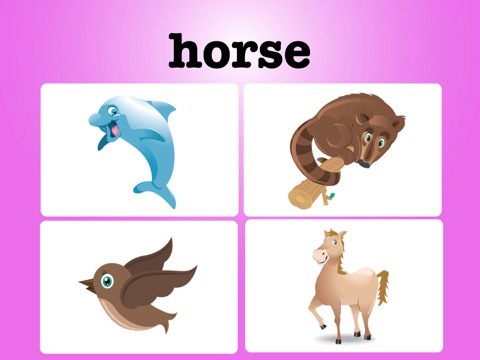 Within each app there are also different levels so the little one is able to do some fun games (spotting shapes, joining the dots by selecting the next number in sequence, up and down) but some will require her to be a little older (find the rhyming words). This is a very simple app that I think might rely a little too much on the pretty hand drawn graphics to sell itself. Essentially there are two options. One to review the animals and one to pick the correct one out of either 2 or 3 pictures. There is little my now-3-year-old daughter enjoys more than dressing her toys up and swapping all their clothes. She also enjoys making imaginary cups of tea (I am British remember) and food for us all. My PlayHome is quite a simple little app. The people as you see them in the picture here are fixed in position like that (you can move them around obviously), but many of the objects that you see around them are interactive. There are 4 rooms: A bathroom, A kitchen, A bedroom and the Lounge/Living room. Every room has specific objects you can interact with. In the bathroom you can put the people in the shower, and when they get wet you can use a towel to dry them off. There is very little animation involved. For example, you know they are wet because they drip, the towel doesn’t move but as you move it over a dripping character the drips disappear. Objects rotate to adapt to the surface you put them on so if you put a kid on a bed then they lie down. Sound accompanies each action. At first, I wasn’t impressed. But the more you play with it, the more you start to appreciate the little things, like boiling the kettle, putting milk in the cup and then letting a character drink it. There is a CD player in the lounge with a collection of different CD’s that you can choose to play with different musical styles. I eventually let the little one have a go too and after showing her the general principles for a few minutes I never got another look in. She quite happily plays with her house and family for ages, totally absorbed. Overall though this app fools you into thinking there is not much to it with its simplicity but actually would definitely be a recommendation I would give to parents with kids of a similar age. 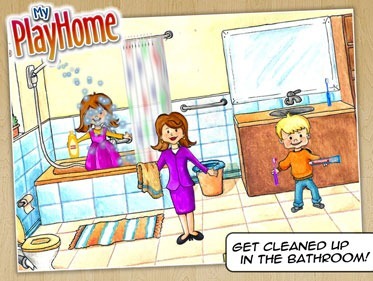 Here’s an App Store link for My PlayHome; it’s priced at $2.99. 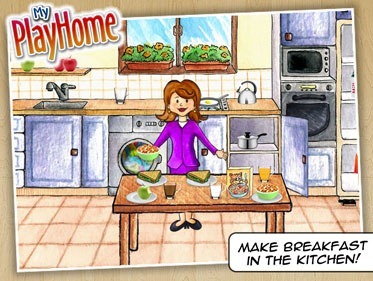 Disclosure: My PlayHome provided a promo code to the post author for the review of this app. For further information regarding our site’s review policies, please see the "About" page.